Tourist information about accommodation, tourist attractions, things to see and do, and visitor information about national parks and reserves in the Northern Rivers, far north coast of New South Wales, NSW, and Gold Coast hinterland, Queensland, QLD, Australia. Normally funded by local councils and member businesses, and staffed by volunteers, extensive tourist information is available at Visitor Information Centres in the Northern Rivers and Gold Coast hinterland. Visitor Information Centres are located in Ballina, Beaudesert, Casino, Kyogle, Lismore, Murwillumbah and Byron Bay, and generally provide a full range of services including booking accommodation and tours. Books, arts, crafts and souvenirs are usually on display and available for purchase. Tourist information is often also available at Community Technology Centres, and cafes or general stores in smaller villages and hamlets. Many accommodation houses will also have local visitor information, tours and attractions brochures available, and can usually assist with booking or advise. 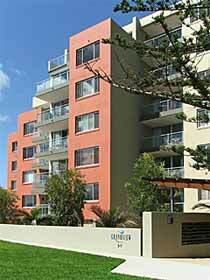 Plentiful accommodation ranges from camp sites in national parks to beachside caravan and holiday parks. Choose from family holiday apartments and pet friendly farmstays for the kids, or treat yourself to a romantic couples only getaway at an award winning luxury beachfront resort or hinterland rainforest retreat. Would you prefer to be at the beach or in the hinterland*? In a rainforest or by a river? Downtown in the thick of the action or chilling out in a quiet village? Take your pick, it's all here. Whether it's the beach or the bush, you'll find that the towns and villages are a great place to relax, unwind and enjoy the natural attractions of the region. Or perhaps you'd like a more active active or adventurous holiday? There are plenty ways to get an adrenalin kick! Take a horse ride through stunning scenery, a canoe trip on a quiet river or dam, bushwalk through the rainforest, or maybe enjoy a thrilling balloon flight above the stunning scenery. There are many day tour operators providing diverse experiences. Choose from coach tours offering traditional style tours to a number of scenic spots and tourist attractions, or for the more individual touch, go with a 4WD tour. 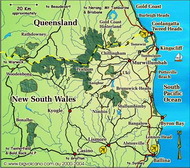 If you'd rather drive and explore to your own schedule, there are a number of local guides and maps with tour routes and scenic drives such as the Lions Road, Summerland Way and Rainforest Way,which are available from local tourist information centres, service (petrol) stations and newsagents. The region boasts a number of tourist attractions, many with nature and outdoor themes, for example Tropical Fruitworld and Madura Tea Estates in the Tweed Valley, and Thursday Plantation (Ti tree) and Macadamia Castle just north of Ballina. Or you can explore the human history of the region with a visit to one of our many museums or historic places. Perhaps you'd like to experience our local culture and colour with a visit to one of our famous weekend markets and farmers markets? 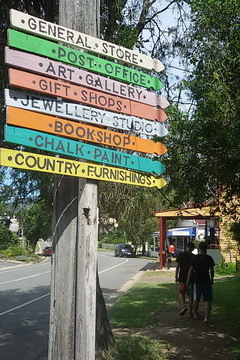 Local produce, arts and crafts and entertainment make for a great day out. And no matter where you are in the region, there's sure to be one close by! For detailed information, drop into the nearest visitor information centre (VIC) for brochures, tourist guides and maps. There is ready access to numerous National parks, reserves and forests, including five of Australia's World Heritage National Parks, which are part of the Gondwana Rainforests of Australia World Heritage listing. With the highest densities of species in Australia in many families of flora and fauna recorded, these parks comprise "Australia's Green Cauldron", and are among the best that Australia has to offer, with spectacular scenery and walking tracks which range from short 200m circuits through various types of rainforest, to challenging overnight and longer treks for the experienced, through huge areas of pristine wilderness. For more information on local accommodation, attractions, tours and services, the Big Volcano (Wollumbin) Visitor Guide is a good place to start. We hope this information is useful. Enjoy your Holiday!